Today I saw Maya Lin’s piece “Pin River – Sandy (2013)” at the Parrish Art Museum in Southampton, NY. (This was my second time; I had seen it about a year earlier at the Pace Gallery in Manhattan.) The photo (taken by me) shows what the piece looks like from across the room. It’s the outline of the areas of New York and New Jersey that flooded during Sandy. This piece brings out one of the changes in awareness that Sandy forced on people in this region. We know now much better than we did before what places are at low elevation near the water: what their names are, and where they are. It’s inherently hard to visualize the region inundated by the storm, though. It’s a large area, but in most places it’s very narrow in width inland from the coast, compared to its length along the coast. If you want to look at it all on a map, the map has to be so large that the flooded area looks like little more than a line – a one-dimensional region rather than a two-dimensional (much less three-dimensional) one. They did it with interactivity, so clicking on some place produces a zoomed-in view of that place, with information in a few different formats (photos, text, map) about what happened there. It’s harder in a static medium. 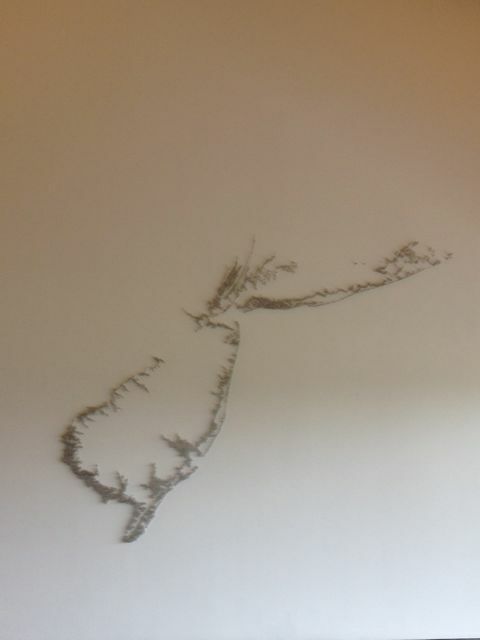 Lin’s piece first highlights the almost-curvilinear nature of the flooded land area, by showing nothing else but the negative white space of the wall. 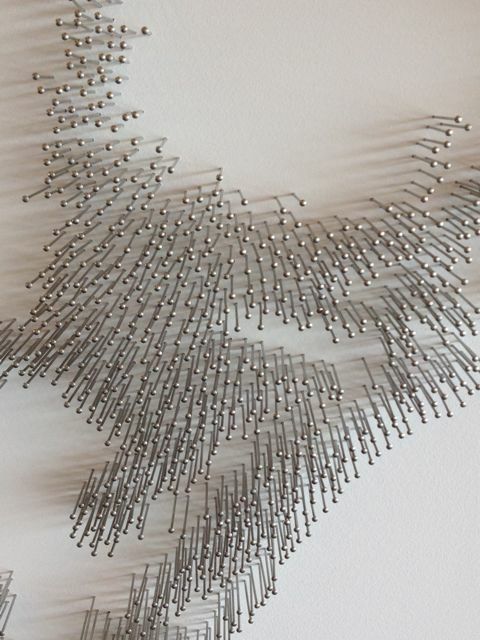 But one is inevitably drawn in for a closer look at the pins, forcing a direct perception of finite width.